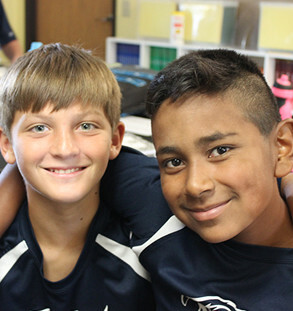 The SJPII Middle School is comprised of students in sixth through eighth grades. We prepare our students for success in high school by offering a rigorous and challenging curriculum administered in a caring, positive learning environment. Starting in middle school, students work in service teams led by a representative of the student council. Saint John Paul II Catholic School has four service teams, which rotate sponsorship and ownership of various community service projects. These service projects include Family Promise, fundraising for our sister school in Uganda, Adopt-a-Highway cleanup, and food collection for our parish food pantry and for the Coalition for Human Care, both supporting poor and homeless people in Moore County. In addition, students serve as flag bearers, Mass buddies, and reading buddies for younger children. The benchmarks and standards for grades six through eight are similar; however, the level of text complexity and the depth of understanding should increase each year for each student. We follow the Diocese of Raleigh Curriculum Standards in all subjects areas. Please visit our Curriculum page to learn more. "We are not the sum of our weaknesses and failures; we are the sum of the Father's love for us and our real capacity to become the image of His Son."